I have read the previous novels of Sharmistha Shenoy who has made an interesting character called Vikram Rana. 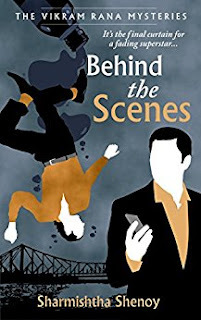 In this novel, the detective Vikram Rana accidentally gets dragged into a murder case of a famous actor in West Bengal. What he did not knew by then is that it would turn out to be a maze which requires investigation on so many other people who were believed to be a suspect only to find out about a startling truth in the end. The novel is a perfect read for those who love mystery and thriller and the characters were used really well by the author making it interesting which I would say would the real success to this. Having said that I am not waiting for the paperback to be released as well. The story would keep you guessing from the beginning till the revelation is made by Vikram Rana which is by far the best and one of the most unusual story plots I have come across.